BEECH GROVE, IN - With Christmas and New Year's Day both falling on a Wednesday this year, the City will be collecting trash for both routes on the Thursday of their respective week. Christmas Day - Wednesday route will picked up on Thursday, December 26, 2013. New Years Day - Wednesday route will be picked up on Thursday, January 2, 2014. No other days are affected. BEECH GROVE, IN - Beech Grove City Court offices have adopted a new schedule for the calendar year 2014. Court offices will be closed on Mondays. Court filings and payments will be accepted Tuesday through Friday, 9:00am - 4:00pm. The office is located at 340 E. Churchman Avenue. BEECH GROVE, IN -- Beech Grove Mayor Dennis Buckley and other local officials will dedicate the Main Street Project with a ribbon-cutting ceremony highlighting infrastructure and beautification improvements along the Downtown business corridor. The project began in March 2013 and includes a bike lane along with new sidewalks, curbs, street lights, storm sewers, flower beds, trees and benches. Main Street is now fully ADA compliant. Since the project began, 12 new businesses have opened their doors along Main Street. Beech Grove also has celebrated major economic development announcements by Citizens Energy Group, Amtrak and ADM Milling. "This is the most significant infrastructure improvement project the city of Beech Grove has undertaken in years," Mayor Buckley said. "We want to celebrate Main Street's new look and welcome people to visit our wonderful 'city within the city.' There's so much happening in Beech Grove right now." The Main Street Project was made possible by a $4.6 million federal grant that required a $1.6 million local match. The Dedication and Ribbon-Cutting ceremony is scheduled for Thursday, November 14, 2013, 1:00pm at the intersection of Main Street and 8th Avenue. BEECH GROVE, IN - The City of Beech Grove will celebrate the completion of the Main Street Reconstruction Project with a traditional Ribbon Cutting Ceremony. This ceremony is scheduled for Thursday, November 14, 2013, 1:00pm at the intersection of Main Street and 8th Avenue. With only a few items remaining for final completion, the City of Beech Grove and CrossRoad Engineers invite the community to enjoy the new amenities and plan to attend the ceremony. 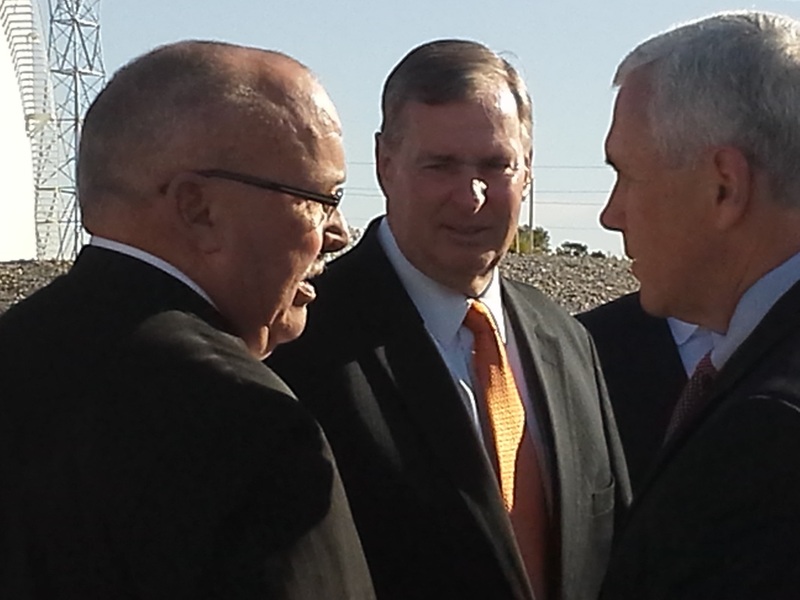 BEECH GROVE, IN - At a joint press conference this morning, Governor Pence, Mayor Ballard, Carey Lykins from Citizens Energy Group and Mayor Buckley announced a massive overhaul of the LNG North and LNG South plants to convert over to natural gas for vehicles. Mayor Buckley said "Our beautiful city could always use some good news and today, boy did we ever hear some! What this means to the City of Beech Grove is immeasurable. Between now and the end of March 2014, we will be the recipient of a 14 million dollar investment at the LNG South Facility. 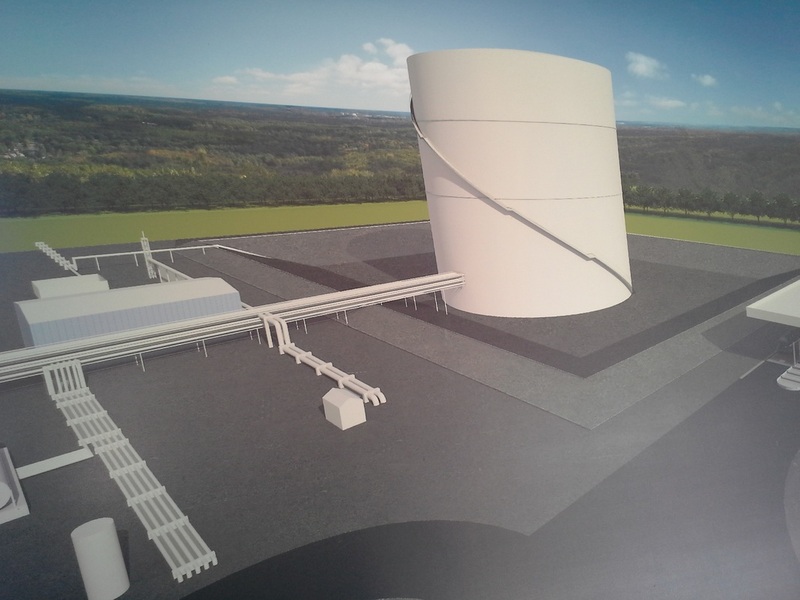 Tankers will deliver natural gas to facilities throughout Central Indiana for vehicular use. "This is just the first waive of investments by Kinetrex Energy to redevelop properties located adjacent to the LNG South Facility. These properties may include properties that have set idle for years. "This comes on the heels of a major announcement concerning Amtrak and the funding of the Hoosier State Line, and continued talks with ADM Milling concerning future projects, with anticipation of a new mill coming on line by April of 2014. "As always we encourage you to visit our website at www.beechgrove.com or you can visit Kinetrex Energy at www.KinetrexEnergy.com for further information." BEECH GROVE, IN - The Metropolitan Planning Organization recently awarded the City of Beech Grove three grants from the "Safe Routes to School" grant program. These grant dollars will allow the city to install sidewalks near Beech Grove High School, Hornet Park Elementary School, South Grove Intermediate School and Beech Grove Middle School so students won't have to walk in traffic. Matching funds for these grants are included in the 2014 MVH (Motor Vehicle Highway) and LRS (Local Road and Street) budgets. Mayor Dennis Buckley said Our Department of Public Works Director, Brad Meriwether, "should be commended for all of the work he put into this grant under a quick deadline. Congrats to all!" Award amounts are listed for each project in the spreadsheet linked below. BEECH GROVE, IN - The Beech Grove Fire Department responded to 101 S. 6th on a reported Residence Fire October 3rd at 00:08 Hrs. Upon arrival initial crews found heavy fire and smoke coming from the first floor kitchen. Beech Grove firefighters were able to keep the fire from spreading throughout the residence. There were over 34 firefighters on-scene to contain and extinguish the fire. Three residents were home at the time of the fire and able to self-evacuate due to smoke detectors alerting the occupants. No civilian or firefighter injuries occurred. Victims assistance provided by 1-800- Board-Up and secured the residence. The fire was ruled accidental caused by a faulty refrigerator compressor. The approximate dollar loss is over $40,000.00. INDIANAPOLIS – Construction is scheduled to begin next week on Operation Indy Commute I-65, a project seeking to strategically reduce recurring commuting bottlenecks at the south side I-465 and I-65 interchange area. Walsh Construction, the Indiana Department of Transportation (INDOT) contractor for the $40 million interchange improvement and added travel lanes project, plans to begin overnight restrictions Monday, Oct. 7 on southbound I-65 between I-465 and Southport Road. The restrictions for temporary pavement widening will be between 9 p.m. and 6 a.m. and are expected to continue for approximately two weeks. Restrictions on northbound I-65 are scheduled to begin the following week (Monday, Oct. 14). The overnight restrictions will allow Walsh to place temporary pavement along the I-65 median in preparation for a future traffic shift. Three lanes will be maintained in each direction on both I-65 and I-465 during peak traffic times, and interstate lane closures may be required at night and other off-peak times. Traffic will be maintained on the existing I-65 and I-465 ramps until improvements are complete. The project is expected to be complete by spring 2015. Widening of I-465 will require reconstruction of the Sherman Drive bridge over I-465 between I-65 and Emerson Avenue. Walsh plans to close the bridge on or after Dec. 1. Sherman Drive traffic will be detoured to cross over I-465 on Carson Avenue. The bridge is expected to reopen by September 2014. The contract allows for closure of up to 7 days on the westbound Southport Road entrance ramp to northbound I-65 to enhance worker and motorist safety as the ramp is connected to a new auxiliary lane to I-465. Additional traffic lanes will be added to both directions of I-65 between Southport Road and I-465. Additional traffic lanes will be added to both directions of I-465 between I-65 and Emerson Avenue. A new two-lane flyover will replace the westbound I-465 loop ramp to southbound I-65. The northbound I-65 ramp to eastbound I-465 will be widened to two lanes. The existing I-465 ramp to southbound I-65 will be reconstructed on a new alignment. Widening I-465 will require closure and replacement of the Sherman Drive bridge. Motorists, businesses and residents are encouraged to learn more about the Operation Indy Commute I-65 project at www.indycommute.indot.in.gov. Subscribe to project email updates by clicking the red GovDelivery envelope icon found on any INDOT web page. Updates will also be provided on the Indiana Department of Transportation: East Central Facebook page and on Twitter @INDOT_ECentral. SEPTEMBER 24, 2013 - The Beech Grove Department of Public Works (DPW) is encouraging residents to mulch, bag or place leaves in trash totes for pick up by the City. There will be no maximum bag limit. Residents will have the option to place leaves at the curb for vacuum collection beginning Tuesday, October 15. Please do not rake leaves into the street. DPW also asks that residents who live near a storm drain adopt that drain and keep it clear of debris and leaves. This will help reduce the risk of local flooding. Leave pickup will continue through December 15. Two leaf vacuum trucks will be in service on Mondays and one leaf vacuum truck will be in service Tuesdays through Fridays. Leaves will not be picked up on Saturdays, Sundays or any designated city holidays. If residents have any questions, please call 803-9091 or utilize the City website, beechgrove.com. BEECH GROVE, Ind. -- Local residents will participate in a community beautification project this Saturday, Sept. 7, at 10:00 a.m.A group of volunteers will repaint the wall bordering the Amtrak facility on South Emerson Avenue in Beech Grove. The wall, which runs from Albany Street to Garstang Street, has endured substantial weather damage. The beautification project coincides with the kickoff of Beech Grove Fall Festival and the reopening of Main Street following months of street and sidewalk upgrades. "This project showcases the spirit of Beech Grove as neighbors come together to give a few hours of their time to beautify our city," said Beech Grove Mayor Dennis Buckley. "We've made a commitment to improving the quality of life for Beech Grove residents through massive infrastructure upgrades, a strong commitment to public safety and a renewed sense of pride in our community," Buckley said. Volunteers who want to participate in the painting project are asked to park at the Beech Grove Bowl at 95 North Second Avenue. Please contact Scott Seach at 784-3743 for further information. BEECH GROVE, IN - Main Street is now open to traffic through to Emerson Avenue. Final surface paving and permanent roadway striping and pavement markings remain to be done during the month of October. Street lights and remaining sod will be installed over the next two weeks. Trees and other plantings will be done in late September or early October. Benches, trash cans and bike racks will be installed mid-October. BEECH GROVE, IN. - The Beech Grove Fire Department responded to 5460 Fetterbush on a reported fire at Park View Apartments, Saturday morning at 4:10 AM. Beech Grove Fire Chief Robert Cheshire reported that "upon arrival initial crews found fire and smoke coming from the roof line and the rear exterior of the apartment building. Beech Grove and Indianapolis firefighters made a quick initial attack and kept the fire from spreading throughout the building. One Apartment unit was damaged by smoke and water. Crews evacuated the adjoining Apartment building. "Approximately 43 firefighters were on-scene to contain and extinguish the fire. The occupants of only one apartment unit was displaced due to smoke damage. The fire was set outside the apartment building and is under investigation. The approximate dollar loss is over $30,000.00. I am glad to report no civilian injuries or deaths occurred on this fire." BEECH GROVE, IN - Cully Contracting was awarded the bid to improve the sewer main connection at Fletcher and 9th starting on Monday, June 24th. Traffic will be re-routed through the neighborhoods while 9th Avenue is closed. The detours should take place no less than 500 feet from the closure at Fletcher and 9th where the sewer work is being done. The project will be completed on or (if possible) before the 28th. BEECH GROVE, IN - The Beech Grove Fire Department responded to 100 N. 5th on a reported Apartment Fire, Sunday, May 29th, at 11:56 PM. Beech Grove Fire Chief Robert Cheshire reported that "upon arrival initial crews found fire and smoke coming from the roof of the apartment building. Beech Grove firefighters evacuated all occupants, firefighters made a quick initial attack in the attic area. Indianapolis fire department utilized an aerial device to open the roof and check for extension throughout the attic. Two Apartment units were damaged by smoke and water. "Approximately 29 firefighters were on-scene to contain and extinguish the fire. The occupants of only two apartment units were displaced due to smoke damage. The Beech Grove Fire Department, Indianapolis Fire Department, and Apartment Management provided victims assistance while on scene for the relocation of those in need. The fire was caused due to faulty electrical wiring. The approximate dollar loss is $30,000.00. I am glad to report no civilian injuries or deaths occurred on this fire. " BEECH GROVE, IN - The Beech Grove Fire Department responded to 4354 Willow Bend Drive on a reported Apartment Fire on Thursday, May 9, 2013 at 5:32 PM. Beech Grove Fire Chief Robert Cheshire reports that "upon arrival initial crews found fire and smoke coming from the roof line of the apartment building. Beech Grove and Indianapolis firefighters made a quick initial attack and set up two aerial devices to keep the fire from spreading throughout the building. One Apartment unit was heavily damaged by fire and a second was damaged by smoke and water. Crews evacuated the adjoining Apartment building. "Approximately 38 firefighters were on-scene to contain and extinguish the fire. The occupants of only four apartment units were displaced due to smoke damage. The Beech Grove Fire Department, Indianapolis Fire Department, and Apartment Management provided victims assistance while on scene for the relocation of those in need. The fire was caused due to a lightning strike. The approximate dollar loss is over $120,000.00. I am glad to report no civilian injuries or deaths occurred on this fire." INDIANAPOLIS – The Indianapolis Department of Public Works (DPW) announced today a new schedule for Saturday ToxDrop locations. Beginning Saturday, June 1, Marion County residents can unload their household hazardous waste on the first three Saturdays of each month. After June 1, ToxDrop locations will be closed the fourth and fifth Saturday of each month and on all major holidays. The new schedule and locations are listed below. · 7550 North Lafayette Rd. - Open first Saturday of each month from 9 a.m. to 2 p.m.
· 4925 South Shelby St. - Open the second Saturday of each month from 9 a.m. to 2 p.m.
· 9049 East 10th St. - Open the third Saturday of each month from 9 a.m. to 2 p.m.
Additionally, residents can drop off their household hazardous waste during the week at the 1725 West St. location on Tuesdays and Thursdays from 9 a.m. to 11 a.m. The City encourages residents to properly dispose of all unwanted and unused household hazardous waste. Examples of materials that will be accepted at ToxDrop locations include antifreeze, brake fluid, batteries, drain cleaners, fluorescent light bulbs, glue and adhesives, paints, paint thinner, pesticides, pool chemicals, household thermometers, toilet bowl cleaners, used motor oil, and gasoline. DPW also reminds citizens that any debris disposed of in public right-of-ways, private property, or City property classifies as illegal dumping. Illegal dumping commonly occurs in alleys, vacant lots, riverbanks and heavily wooded areas. Illegally dumped debris can be tree limbs, appliances, full garbage bags, etc. Illegal dumping is punishable by fines of up $2,500. If you witness illegal dumping on public property, please report the incident to the City through the RequestIndy mobile app or at www.indy.gov/RequestIndy or by calling the Mayor's Action Center (MAC) at 327-4MAC. Find additional Information at www.indy.gov/toxdrop. BEECH GROVE, IN - CrossRoad Engineers Lance Stahley has announced they are quickly approaching a major milestone for the Main Street Project. "We are getting ready to open Phase I to traffic from 13th to 8th Avenue on Friday May 10th. You may have already seen the schedule in the most recent newsletter update. However, I wanted to remind you separately that the schedule has changed slightly but has not affected the opening of Phase I to traffic. Paving will be on Wednesday and Thursday of this week for the Base and intermediate lifts of asphalt. The signal at 10th will be activated on Thursday the 9th. On Friday the 10th after school lets out the two-way condition currently between Albany and the alley will be returned back to a One-Way north condition. So when everybody returns to school on Monday the 13th, they can anticipate being back to traffic patterns that were in place prior to the project beginning. There will remain to be the surface paving at the end of the project and therefore the roadway will be temporary striped with double yellow centerline striping on Main and stop bars on the side streets. This phase will be open to traffic but will have remaining items to be completed outside of the roadway so anticipate work to continue from the parking areas along Main Street. 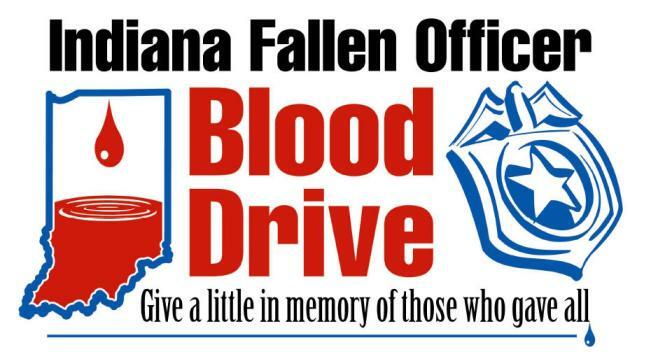 BEECH GROVE, IN - The Beech Grove Police Department will be having their annual Indiana Fallen Officer Blood Drive on Saturday, May 18, 2013 from 0800-1100. The drive this year will be held at Fire Station 101, 330 E. Churchman Ave, in the parking lot. Their goal is 21 donors. Last year 13 donors participated. Deputy Police Chief Michael Maurice is inviting everyone to give this year to honor our fallen. If you would like to give, you can email him at Michael.Maurice@beechgrove.com with the time you would like and he will try to accommodate. The time slots are two people every 15 minutes. Please consider giving and thank you. Phase I (13th to 8th Avenues) will be asphalt paved the week of May 6th and is tentatively anticipated to be opened to traffic on Friday, May 10th. This aggressive schedule is allowing the City to let the contractor move into further extended phases earlier than previously discussed. Phase III will now be from 6th to 3rd Avenues and will be closed to vehicular traffic as early as May 6th and removal of the roadway will take place as soon as feasible after the closure so that the infrastructure can begin. There will potentially be an overlap of Phase I and Phase III closure by as much as five days. The newsletter update for the Main Street project linked below has more information and updated phasing and schedule due to the progress being achieved in the first phases. The intent of closing another phase for work earlier than originally anticipated is to be able to open that phase ahead of schedule. Infrastructure has begun from 8th to 6th Avenues (Phase 2). From 13th to 8th Avenues (Phase 1) infrastructure is now complete and the subgrade is being prepped. Phase 1 will get aggregate base the week of April 22nd and then curbs and sidewalks will follow. Also during the week of April 22nd you will begin to see foundations for the new light poles being installed. Where concrete walk has been removed, a temporary stone walk is being installed for access purposes. At some point this stone walk will be graded for the new permanent concrete walk placement. When this walk is formed for pouring the new walk there will be some inconvenience at the Main Street access. Phase 1 and Phase 2 closure will continue through to late June. There wil be no closures from 6th Avenue to Emerson Avenue until Phases 1 and 2 are open to traffic. Open to traffic will exclude the final surface pavement and permanent striping of the roadway. You can read more in CrossRoad Engineer's Beech Grove Main Street Project Newsletter, Vol. 4. Beech Grove has been named a 2012 Tree City USA by the Arbor Day Foundation in honor of its commitment to effective urban forest management. This is the eighth year the city has earned the national designation. "Everyone benefits when elected officials, volunteers and committed citizens in communities like Beech Grove make smart investments in urban forests," said John Rosenow, founder and chief executive of the Arbor Day Foundation. "Trees bring shade to our homes and beauty to our neighborhoods, along with numerous economic, social and environmental benefits." Helpful information for residents planning to plant trees is available on the Greenscape Commission webpages, or contact the commission by emailing greenscape@beechgrove.com. BEECH GROVE, IN - Pavement has mostly been removed from 13th to 8th Avenues and the new infrastructure has begun. Main Street will be closing between 8th and 6th Avenues on March 27th dependent on the weather. This closure will continue through mid to late June along with the closure west to 13th Avenue. During this closure vehicular access to businesses and homes shall be via the alleys north and south of Main Street. No parking signs will remain on 10th Avenue north of Main for the school to have two-way traffic on 10th between the alley and Albany Street. There will be no closures east of 6th Avenue until Main Street is open for traffic between 6th and 13th Avenues. 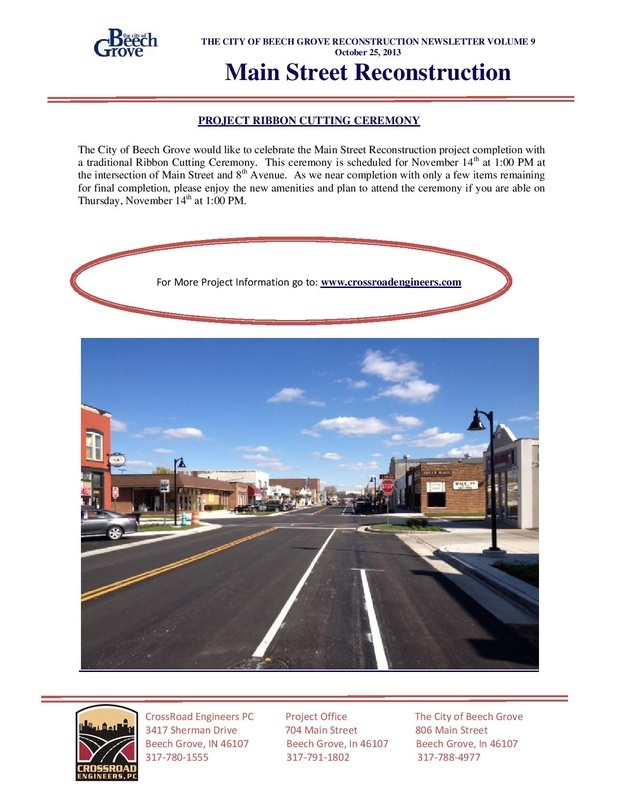 You can read more in CrossRoad Engineers' Beech Grove Main Street Project Newsletter, Vol. 3. Tree removals along the Main Street project will continue as soon as this week, progressing from 8th Avenue towards Emerson Avenue. There may be short term inconvenience and disruption to certain parking spaces to accommodate equipment and personnel to remove the trees. The contractor doing this work will mark affected parking spots with construction barrels prior to the tree removal and re-open the spaces as soon as the tree near the space has been removed. BEECH GROVE, IN - The start of the demolition phase for Main Street improvements is just two weeks away. You may have already noticed the advance notice of closure signs placed at the 13th Avenue and Emerson Avenue ends of Main Street. The current plan is to set-up the closure for Main Street between 13th and 8th Avenues on Saturday, March 2nd so that it is in place as the contractor starts demolition of the existing roadway on Monday, March 4th. This will include the closure of 11th, 10th and 9th Avenues between Main Street and the alleys both north and south of Main Street. 10th Avenue between Albany Street and the alley north of Main Street will be striped for two-way traffic during this phase of the project for access to Central Elementary School and the Beech Grove Public Library. No Parking signs will posted here during this phase of construction to safely allow for two-way traffic. Local pedestrian traffic will be maintained throughout construction and a detour for vehicular traffic will be posted. Alleys or surrounding roadways that were recently paved in anticipation of these closures can be used for alternate routes or rear access. Additional information is available in the newsletter from CrossRoad Engineers linked below. You can also feel free to stop by the CrossRoad Engineers project office, 704 Main Street, to inquire about any aspect of the project. BEECH GROVE, IN - Mayor Dennis Buckley will be presenting his State of the City Address on Wednesday, January 30, 2013, 7:00pm at the Elton H. Geshwiler Senior Center, 602 Main Street. Originally scheduled at City Hall, the location has been changed due to a conflict concerning the City Court. Everyone is welcome and encouraged to attend. Beech Grove, IN - On February 4, 2013, the Common Council of the City of Beech Grove will conduct a public hearing pursuant to General Ordinance No. 1, 2013. General Ordinance 1, 2013 calls for an adjustment in rates established for treatment of wastewater and disposal of residential trash in the City of Beech Grove. The public hearing shall be held in the Council Chambers in City Hall located at 802 Main Street, Beech Grove, Indiana commencing at 7:00pm, local time. Pursuant to the Indiana Open Door Law, this notice shall be posted in common place for viewing by the general public, and the General Ordinance shall be made available to the general public. This notice will also be posted at Beech Grove City Hall, Elton H. Geshwiler Senior Center, Hornet Park Community Center, Beech Grove Public Library, published in the Indianapolis Star newspaper, and be available in the Clerk Treasurer's Office.